This deluxe, all color book offers a study of magic and necromancy through the ages, with 340 illustrations. 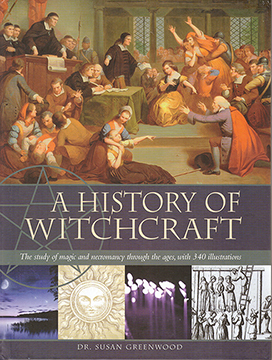 It offers a detailed historical and anthropological study of the traditions of witchcraft around the world, with an in-depth examination of magic and its relationship with religion from prehistory to the post-modern era. It includes an international survey of ancient cultural traditions, and details the medieval phenomenon of witch hunts that still have resonance in modern society. It analyzes the ancient traditions of shamanism, the witches of the classical world and African witch doctors, together with the development of witchcraft in popular European culture. It draws on the work of numerous scholars and experts, as well as firsthand research by the author, and is lavishly illustrated. Magic has played a part in most cultures throughout human history. Traditions and practices may differ but the essential elements remain the same. This insightful history examines the roots and foundation of magic, and the way it has helped to shape our view of the universe and our place within it. The scope of the study is wide, covering a range of traditions from the wise woman of a 16th-century English village to a witch doctor in Africa and from the customs of Native American shamans to those of female shamans of Korea, examining their beliefs, ideas and convictions through the ages. Illustrated throughout with archival material and fine art paintings of legendary magic workers, this volume is a comprehensive examination of a fascinating history. Deluxe, all color book, imported from Britain. A HISTORY OF WITCHCRAFT: The Study of Magic and Necromancy through the Ages By Dr. Susan Greenwood. 160 Pages. 7x9 Hardback. Illustrated. All Color. Index.